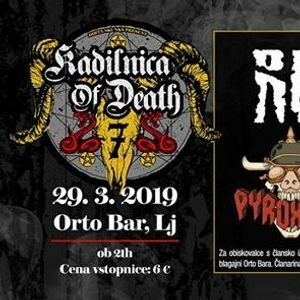 Napovedujemo še en Kadilnica of Death Extra koncert, ki bo poseben iz dveh razlogov: ker se bo odvil na petek in ker bodo tokrat nastopili gostje iz sosednje Italije! 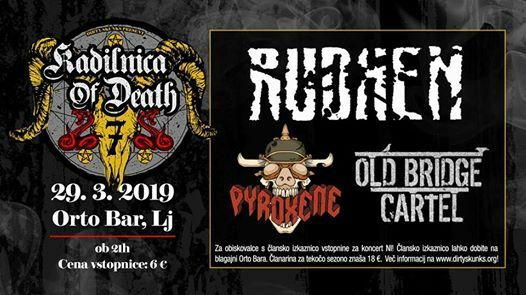 Orto Bar bodo namreč obiskali italijanski doom metalci/stoner rockerji RUDHEN, družbo pa jim bosta delala dva domača banda - heavy metalci PYROXENE iz Ljubljane ter mariborski hard rockerji OLD BRIDGE CARTEL! Rudhen was born in the spring of 2013 by three friends: Luca De Gaspari (drums), Alessandro Groppo (voice) and Fabio Torresan (guitar), they wanted to dial a stoner-rock band. After a short time Riccardo Rix Rigo (bass) joins the band and, in 2015, he is replaced by Maci Piovesan. 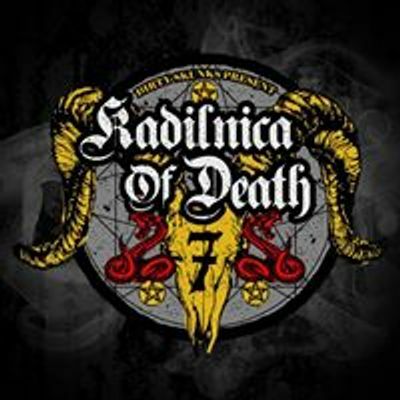 The first live begin in January of 2014: from this date they produced two EP (“Rudhen” in 2014 and “ Imago Octopus” in 2015), four videoclips (“Hellraiser”, “Black Spirit”, “My soul on fire” and “Arabian Drag”) and many dates in the north and middle of Italy and also in Europe (Austria, Germany, Denmark, Slovenia, Croatia). In 2017 Davide Lucato joined the band as bassist, and with him Rudhen recorded the first complete album: “DI(O)SCURO”; accompanied by the videoclip of single “Magnetic Hole”. Evocative and visionary lyrics and a mellow and hypnotic sound which have gone, in the last period, to the doom, with various psychedelic inserts. If the first works was markedly stoner rock, “DI(O)SCURO” represents an evolution to smoky and obsessives atmospheres (who remember the Sleep, without forgetting the lesson of the fathers of the genre: the Black Sabbath) all supported by elements of individual creativity of the components. Although our band Pyroxene was first founded on the 28th of December, it wasn't untill 2014 the new lineup with Kristjan Hacin – Kiku (solo guitar), Andraž Kumar – Žaži (rhythm guitar), Matevž Hrovat – Mate (bass guitar), Jan Tehovnk – Teho (vocal) and Anze Mikulan (drums) arose from the primordial fire and became the band we know today. Our repertoar stretches from blues elements and hard rock to heavy metal, whereas we define ourselves as »solid metal«. In the year 2012 we began our first concert season, during which we had quite a lot of concerts in different locations, such as Metelkova City, the annual gathering of MC Firestarters in Vinica, on Kongress square etc. The true climax of the year was a concert, where we performed as the opening act to the band Elvis Jackson in MKC Komplex in the region Koroška. In 2013 we were also hosted on the online radio Radio Turk and we began to cooperate in a side project with the Center of Activities Fužine (CAF). The same year we performed on the audition for the festival Vičstock, which was hosted by club Cirkus in Ljubljana. After that we also performed on Turkstival and Rock'n'roll ''All you can hear'' Požrtija. In the year 2014 we won the band contest on the Rock&Walk festival, as far as our own organisation is concerned we put together a concert called Pržan se prži in the club Pržan (Ljubljana). We were also chosen by studio Evolucija to record a single, furthermore we played on several other concerts in Ljubljana and the rest of Slovenia. At the begining of the year 2015 we had concerts in the club Patriot in Novo Mesto, soon afterwards in Orto Bar within the organisation Kadilnica Of Death, and at the end of February we were also hosted on radio Europa 05. In late May we departed on our first international tour in the Netherlands, where we had three very successful concerts in HPC in Den Haag, Waterhole in Amsterdam and Rock Cafe Bone in Haarlem. Shortly after our tour we performed in Hard Place in Zagreb and on our biggest venue so far, Rock Batuje festival in July. Old Bridge Cartel - 5-članska hardrock zasedba, (pretežno) iz Maribora! Javnosti smo se prvič predstavili septembra 2017, na festivalu "Skuštrane! in bradati" v MC Pekarna ter pokazali rezultat enomesečnega dela - 3 coverje in 3 avtorske pesmi! Naša glasba je nesramna mešanica hard rocka in heavy metala, trdih riffov in udarnih ritmov, podpretih z ženskim vokalom - to, kar slovenski glasbeni sceni še vedno manjka! No, tu smo! Trenutno pridno vadimo in ustvarjamo, da vam lahko čimprej pokažemo, kaj pomeni OBC!